Up and coming rapper shot dead in his Far Rockaway flat. The artist, Stack Bundles (real name: Rayquon Elliott) was shot once in the head and once in the neck as he entered the lobby of his Queens apartment building just before 6 am Monday morning. Bundles burst onto the rap scene after he brazenly approached Dipset's Jim Jones and asked the Harlem-based rapper to put him on. Stack was also down with Fabolous. Holla. Police Find Human Head Near Water Filtration Plant in Trenton. The Farm Aid benefit concert is planting itself in NYC. Co-founders Willie Nelson and John Mellencamp made the announcement with Bloomberg at Union Square today. The show will be held at Randalls Island on September 9. They didn't say who'd be playing yet. There will be a Sopranos movie and alternate endings on the final season DVD. I HATE this song but I've always loved the theremin. Dan Rather calls out Katie Couric; says she dumbs down and tarts up the news. A college student who died of tuberculosis Friday in Colorado could have had the contagious form of the disease for more than four months. Sweet. Al Roker is a f*cking tool. The NBC weatherman who helped spearhead the campaign to get Don Imus fired is now coming under fire for a joke he made on air about people with epilepsy. Hypocrite. NYC About Due For Major Hurricane... Blinding winds. Driving rain. Massive floods. We've seen the pictures of a hurricane's destructive power. Now emergency officials say it's time for NYC to prepare for the worst. They just don't know when. Panic. Now. 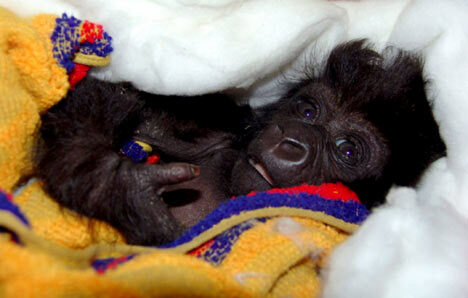 Baby mountain gorilla found clinging to body of mother executed by rebels in Congo.